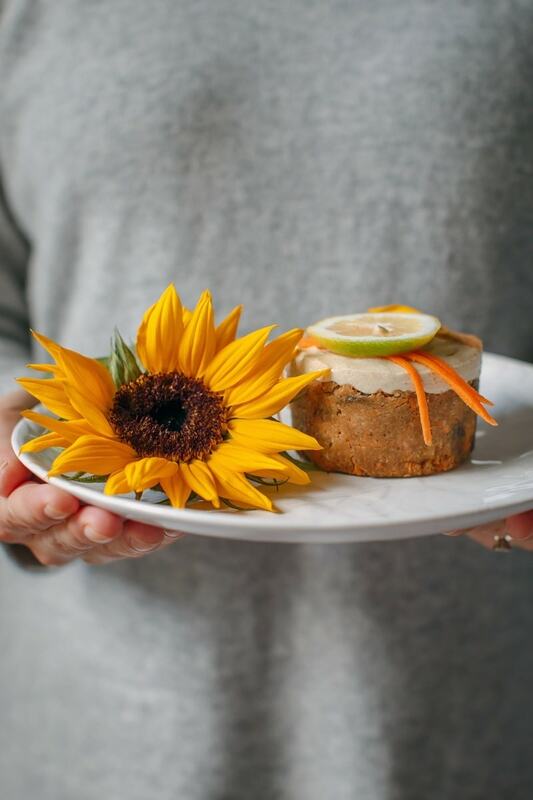 These mini raw carrot cakes have some serious spice to them. The longer you leave them – the better they taste! Finish them off with a creamy lemon essential oil infused frosting for something extra special. Naturally gluten free and vegan. Something a little different today – and perfect for the very last of this Autumn weather. 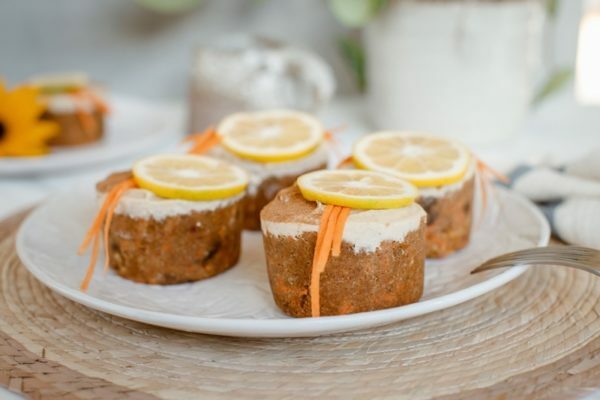 Raw carrot cakes made with sweet and earthy carrots, ample aromatic spices, juicy sultanas, and a lavish lemon essential oil infused cashew frosting. 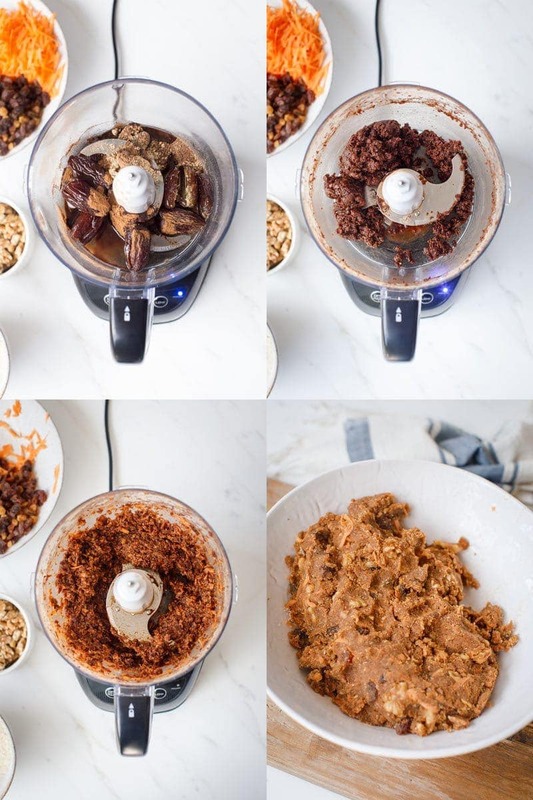 These raw carrot cakes can be whipped up in a food processor in no time at all. Start by adding juice pitted Medjool dates, coconut oil, sea salt and spices (cinnamon, ginger, nutmeg) and pulsing till it combines to form a paste of sorts. Hot tip: use the freshest ground spices for maximum flavour. Next, add a generous amount of grated carrot, and pulse again to combine. 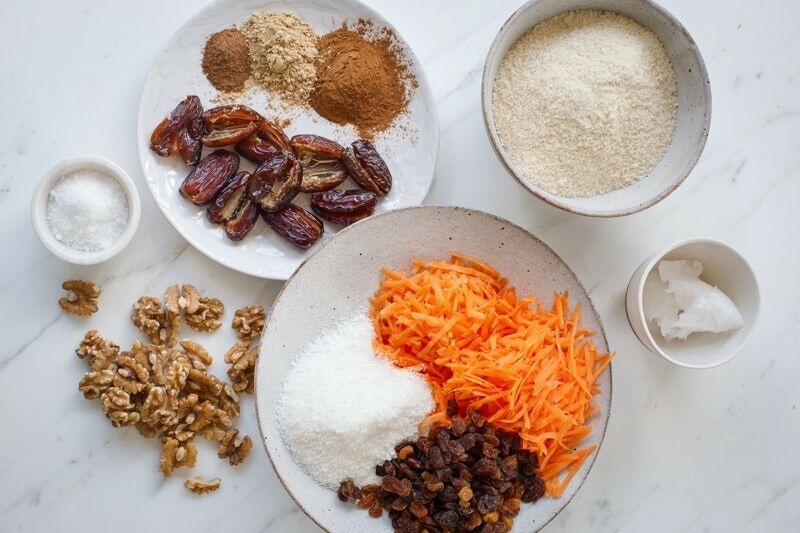 From here, you want to transfer the mixture to a large bowl, and fold through the almond meal, coconut flour, walnuts, sultanas and a little more grated carrot. The mixture may feel dry – just wet your palms and massage the dough together and it will be just fine. Once combined, spoon the mixture into muffin or cheesecake baking tray cavities, leaving room for the frosting we’ll add in a moment. 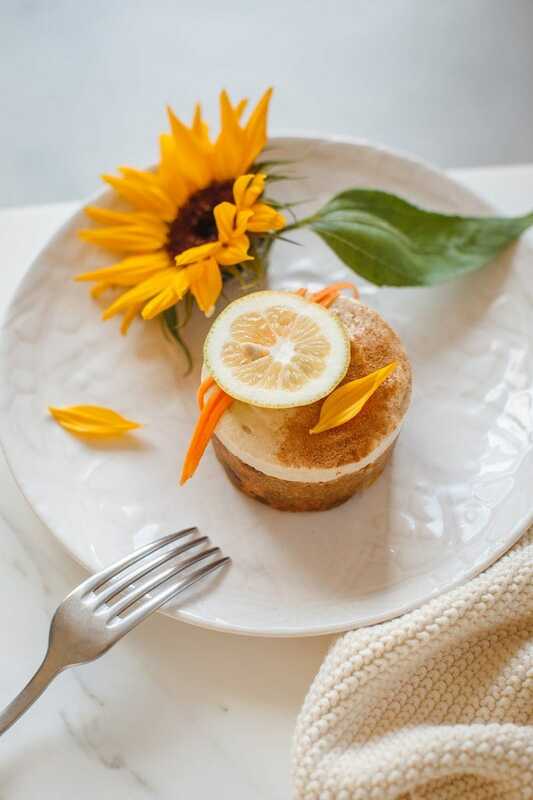 Our little raw carrot cakes are going to need a thick slather of frosting – a doTERRA lemon essential oil infused cashew number in place of your traditional, overly sweet cream cheese icing. 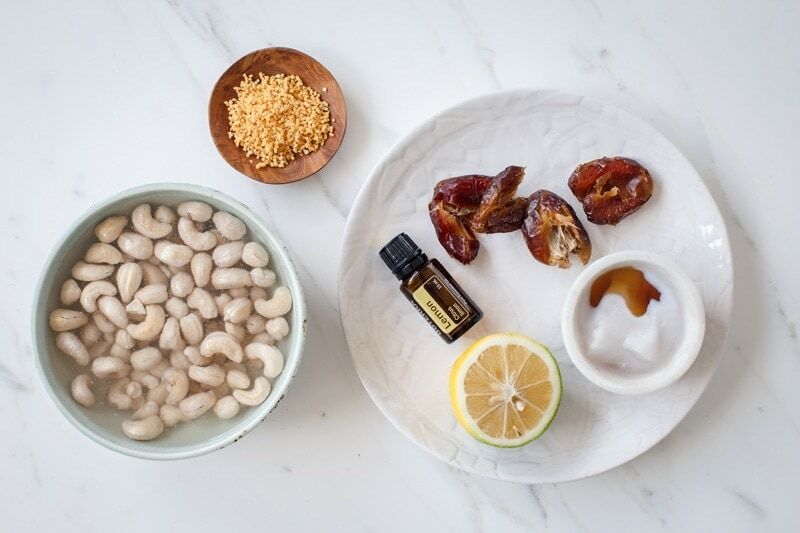 You’ll need a few simple ingredients – raw, natural cashews, Medjool dates, pure maple syrup (just a dash), coconut oil, fresh lemon juice and zest, lemon essential oil, and a little organic soy lecithin. First, soak the cashews in water for a couple of hours to soften them, then drain and rinse well. Next, add all ingredients to your blender and blend for a minute or so until smooth and creamy. 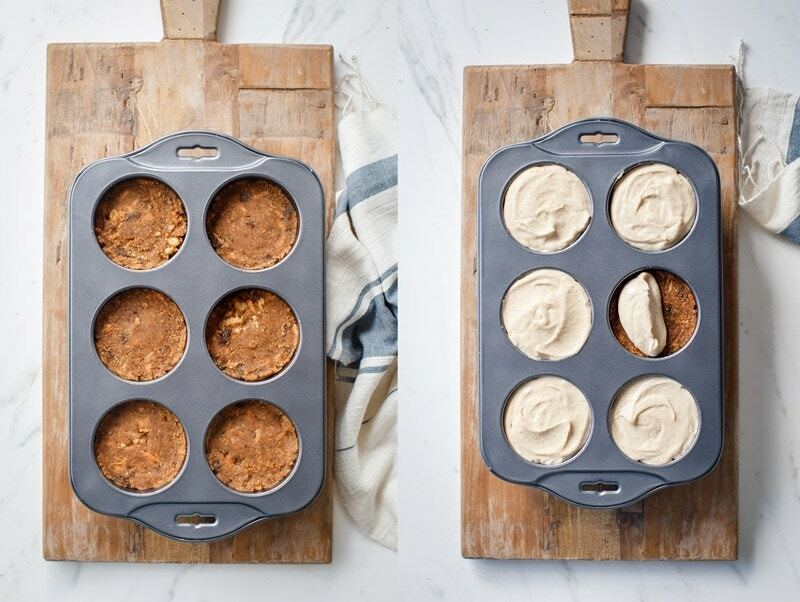 Spoon the frosting over the raw carrot cakes and set in the fridge or freezer. Expect the icing to eventually thicken somewhat – it won’t go rock hard. 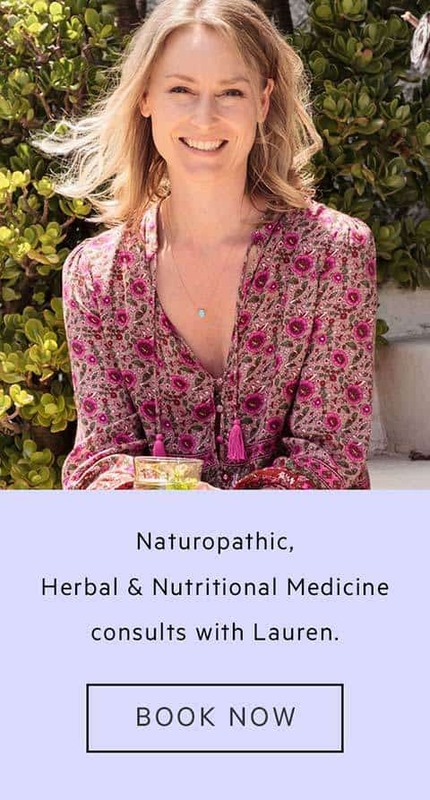 If you’d like to get to know essential oils a bit better, then come along to one of my introductory classes. 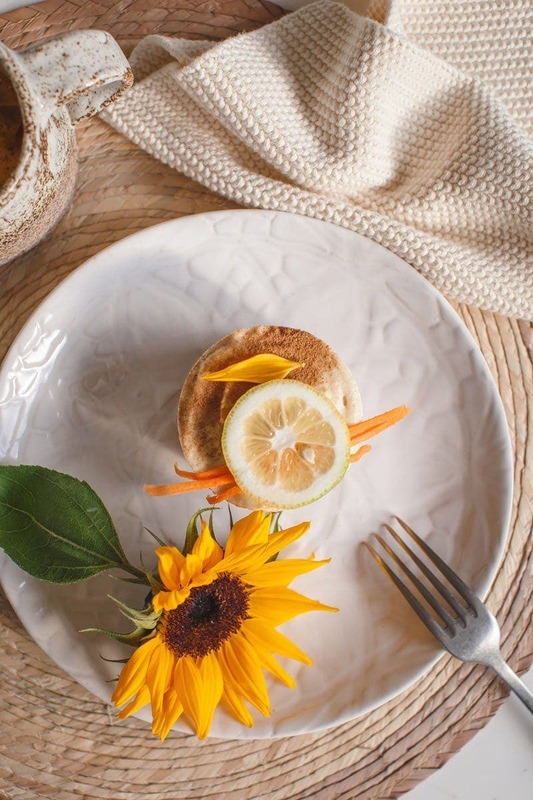 We had a jam-packed class just yesterday – sipping on herbal tea, enjoying essential oil infused treats, and learning about the vast therapeutic potential of these beautiful plant extracts. Just send me an email if you’re interested and I can tell you more. All gluten, dairy and egg free of course! 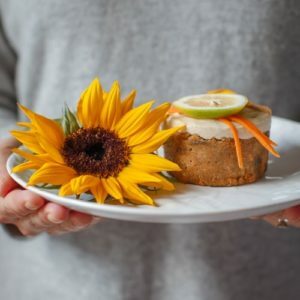 These raw carrot cake muffins have some serious spice to them. Finish them off with creamy lemon essential oil infused frosting for something extra special. 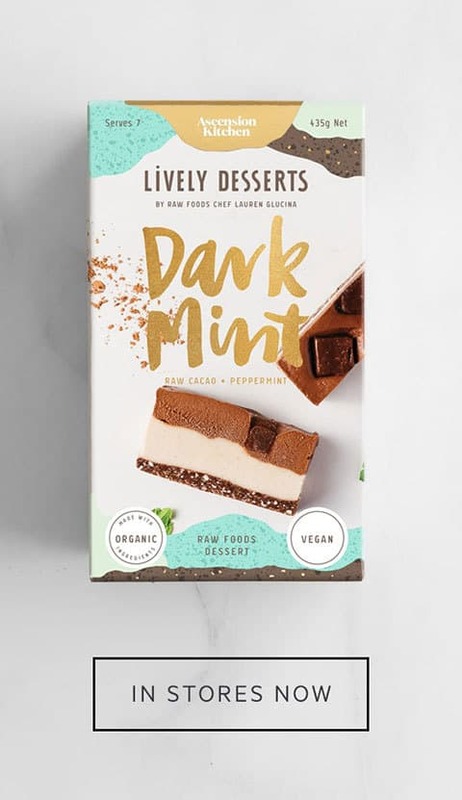 Naturally gluten free and vegan. This recipe makes 6 large muffin sized cakes, which serve 2 each (they are rich and dense), or 12 smaller, single sized portions. Note: the cashews for the frosting need to soak a couple of hours before use. Blitz the dates, coconut oil, salt, cinnamon, nutmeg and ginger in a food processor till well combined – it will yield a thick paste. Add 1½ cups of the carrot and blitz again. Mix in the rest of the carrot, the almond meal, coconut flour, sultanas and chopped walnuts, till thick and doughy and well combined. Spoon the mixture into 6 large muffin baking tray cavities (or, 12 small). Use the base of a glass to flatten the surface, set aside. Drain the cashews, then blend all ingredients on high till smooth. Spoon the mixture over the top of the carrot cakes and smooth out the surface with a knife or spatula. Set in the fridge for a few hours, then release the frosted carrot cakes from the cavities and serve. This will make 6 large muffin/individual cheesecake sized carrot cakes, though each is enough for two serves. Alternatively, use a 12 cavity tray to make smaller, single size portions. The tray I used was a cheesecake baking tray – the base of the cavities is removable which makes for an incredibly easy job of popping them out afterwards. If you do not have a removable base, try lining the cavity with cling wrap, or use paper cupcake wrappers. Organic (non GMO) soy lecithin is an emulsifier, helping combine the water and fat component of the frosting. It is required to help thicken and set the frosting. Sunflower lecithin is an alternative though will colour the frosting a shade or two darker. Most people with soy sensitivity can still tolerate soy lecithin as it contains no protein. If the carrot cake mixture feels dry – just wet your palms and massage the dough together and it will be just fine. To serve, slice a fresh lemon and use a julienne peeler to create a few thin ribbons of carrot to lay over the top. Serve with a hot chai! Will store in the fridge 3-4 days.